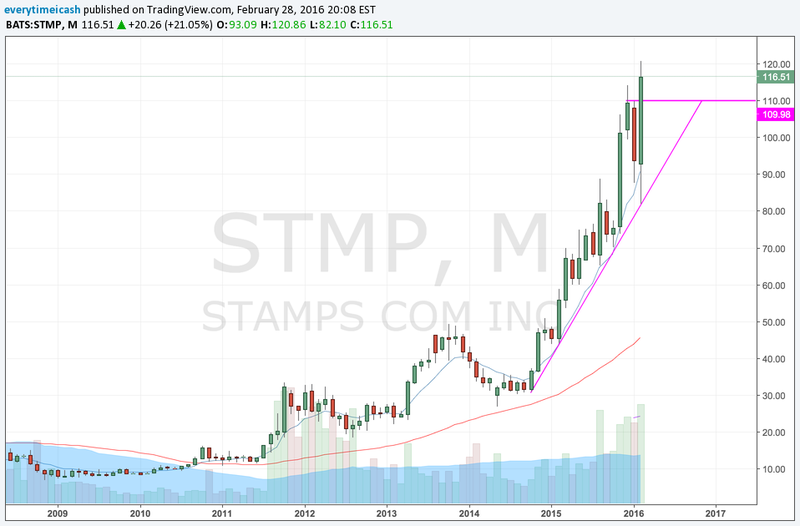 Stamps.com $STMP rallied 21% on Friday and was up as much as 25% at one point after reporting an astounding Q4 results and providing bullish guidance for 2016. This quarter exemplified the managements complete turnaround of the company and caught the analysts out of position (rare). Stamps.com is a provider of Internet-based postage services and allows customers to buy and print postage on their computer without having to visit the post office. The company charges a monthly subscription fee plus postage cost. Its platform is also integrated in key partner programs like MS Office and $AMZN marketplace. Historically the focus has been selling to individuals and small businesses. Recently however, the shift has gone towards more lucrative high volume shippers (warehouses, fulfillment houses/centers, boutiques and high volume retailers) and enterprise markets. This segment shift is more attractive on the margins side, ARPU, and lower churn rates. To get there, $STMP has been active on the M&A front. Its most prominent recent acquisition was buying Endicia from Newell Rubbermaid ($NWL). The deal closed in November 2015. Endicia is a major provider of high volume shipping technologies with seamless access to USPS. In Q4 Non-GAAP EPS more than doubled YoY to $1.57, which was well above consensus of $0.95. Revenue rose 67.0% year/year to $69.9 mln, which also was well above consensus of $59.0 mln. $STMP also guided higher for 2016 as they expect non-GAAP EPS of $5.00-5.50 and revenue of $290-310 mln. Both were WELL above consensus with EPS being well above expectations: consensus was $4.33 and $289.7 mln, respectively. Q4 Mailing and Shipping revenue was $67.2 million, up 67% YoY. In terms of margins, $STMP is highly profitable. Adjusted EBITDA margin for Q4 came in at 43.2% vs 30.5% in the prior year period. This margin expansion was huge and caught the street off guard. $STMP says it was very pleased with its financial performance. Management says this was another exceptional year for Stamps.com with strong execution on its business goals. This included the integration of its 2014 acquisitions of ShipStation and ShipWorks where $STMP began to realize as it expected from those deals. In late 2015, STMP completed the Endicia acquisition and it has begun working on the process of integrating these businesses. Record paid customers of 633,000 in Q4 was up 21% YoY and record ARPU, which was $35.35 was up 38% YoY. In addition, total postage printed for Q4 was $1 billion and that was up 71% YoY. For the year as a whole, total postage printed was $2.7 bln, up 52%. On the call, management described how the business has transformed fairly dramatically over the past few years with a focus on growing its high volume shipping business and with its acquisitions of Endicia, ShipStation and ShipWorks. As a result of those acquisitions, $STMP now has a very wide range of customers and business models. Their shift from one off customers to larger volume shippers is the root of their turnaround. This increased focus on shipping allows $STMP to expect revenue increases in seasonal periods. In particular, Q4 is expected to be meaningfully higher than the other three quarters due to the seasonally strong Q4 holiday shipping period as STMP saw in 2015. That said, don't expect the same in the 1st quarter of 2016. $STMP adjusted EBITDA margins, which is a good proxy for cash flow, really sootd out. Q4 came in at 43.2% vs 30.5% in the prior year period. Those are some big margins. Expect that to moderate in Q1 and Q2 as these seasonally slower quarters will not benefit as much from spreading fixed costs over such a large revenue base. But even in the high 30% range is good. As long as management can maintain this model and fixed costs this should remain a buy. Market permitting.